This fits my requirement of fun, but it looks more complicated than I wanted to tackle this month. I've bookmarked the site for future use though! Christianne from Little Page Turners said she brought string cheese for her daughter's class (to mixed reviews). Their school does not allow homemade food, only store bought. You'd think finding fresh, tasty string cheese in Wisconsin would be an easy task, but not so, at least in our experience. My husband's parents live near a cheese factory that makes the absolute best string cheese, but I'm just not willing to drive 3+ hours for a school snack. I'm sure there's a closer source, so we'll have to search around before next month's leader day. After spending a bit of time online browsing, I decided to bring bananas and let the kids turn them into ghosts. (Modified version of Family Fun Banana Ghosts idea.) Since I was volunteering at school during snack time I was able to help peel and cut the bananas in half. 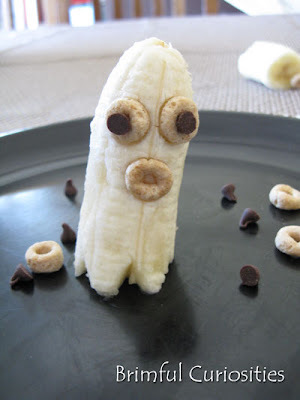 Then I provided each child with a small bag of regular Cheerios and a few mini chocolate chips and let them decorate their own half-banana ghosts. I loved all the variations - one boy made his into a one-eyed alien and one of the girls made hair for her ghost. Almost all the kids ate their creations when they finished creating so I guess the snack was a hit! 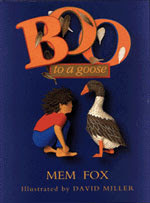 Imagine my surprise when I learned that the class treasure book of the day was Boo to A Goose by Mem Fox, illustrated by David Miller. The kids might not say "Boo" to a goose, but they sure had fun making their ghosts say Boo! What books would you recommend reading along with the Banana Ghosts snack? We like Ten Timid Ghosts by Jennifer O'connell, Ghosts in the House! by Kazuno Kohara and The Ghost's Dinner by Jacques Duquennoy. Also, do you have any other suggestions for fun and healthy school snacks? Let me know - we're still searching for more ideas! Snack ideas? I think I should have that down by now,but I don't. No real great ideas here...just lame ones. I hope get some suggestions though. What a cute (and simple!) snack- I love it! What a cute idea. I really like this. I only have to do this twice a year, but last time I brought a bunch of things and let the kids make their own trail mix. I brought Cheerios, choc chips, raisins, little pretzels, and goldfish crackers. The kids really enjoyed this. The other time (mid March), I brought rainbow jello that we made ahead of time. Cool snack Idea! Going to surprise this week with this one. thanks for all your tips. That's awesome! I'm going to pass this along to my kindergarten-teaching wife. They turned out adorable! I hate that we have to bring in store bought. Parents bring in the worst junk food. Love that yours was healthy and fun! This is so fun and different! I like it. I love this! I pinned it. My son is going to be a ghost for halloween so I've been looking for all the ghost treats I can find.